Here are more Christmas ornaments that I made by recycling old Christmas cards and crocheting an edging around them. For more details check out the recycled Christmas card tutorial. Recycling old Christmas cards into ornaments has become a yearly project for me. I love making the card ornaments and handing them out to people or including them with their Christmas gift. A handmade item is always so special and being recycled makes it even more unique. I love that idea. 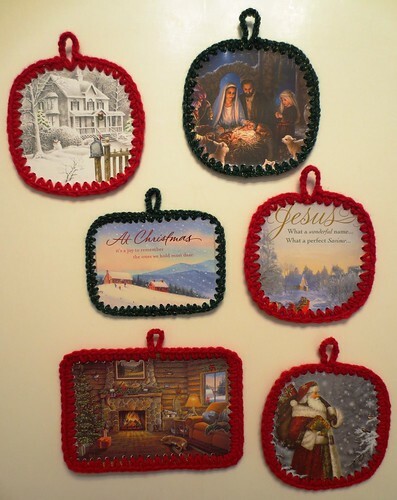 I’m going to start making the recycled ornaments to give out at the nursing home where I volunteer. Thanks for sharing this great idea. 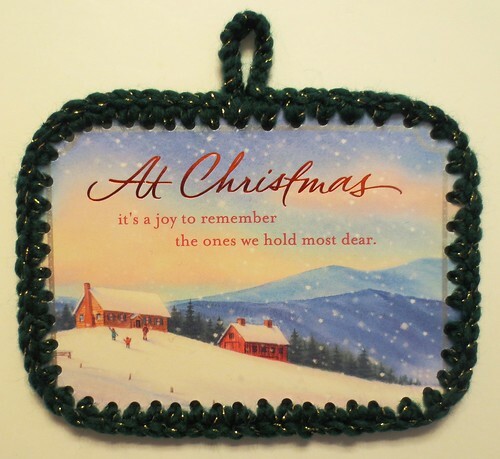 Jackie – I gave out several of these recycled card ornaments at my local nursing home and the people just loved them. I also handed them out to the postman, store clerks and other people I met over the last few days. It is fun to share a little handmade gift with people and pass on the Christmas spirit too.